This flower grew to about 16 inches tall. I believe the stand is cherry and the petals are made of African Padauk. The center is blown glass. This piece started because I noticed the grain in the ambrosia maple looked like clouds. So I grooved out a piece of mahogany and put in cherry inlay. The border is made of zebrawood. Then I carved a couple of hanggliders out of mahogany and brushed on a gloss finish. I still don't feel like it is finished and may try to add a mountain range along the horizon line. 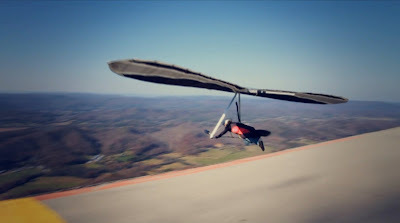 What's hang gliding without mountains? All of my pieces are for sale. If you are interested, my email is hangwait@gmail.com. Custom orders are available. My new T2C arrived this week and it is beautiful. I took a sledder down off of the bandit launch Wednesday morning for the first flight. 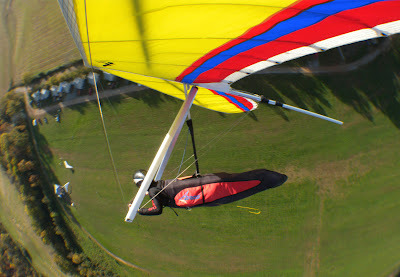 Everything went great and this is by far the best handling/perfoming glider I have ever flown. The roll response is immediate, unlike other toplesses that may take a few moments to respond to input. Thursday I went back to the top around 1:30pm for another flight. There were light winds and a nice crowd on launch, maybe 8 - 10 gliders. 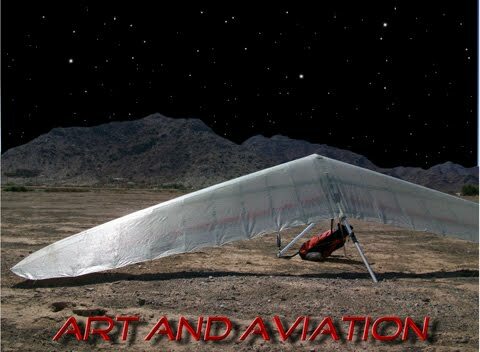 I launched first and found a decent wintertime thermal that, once above the ridge, turned on quite nicely and took me 2,400 over launch. Then I cruised out into the valley to play with the VG and test the speed range of the new beast. After playing a while I went back to find Lucas, Carl, Scott, and others in the air. Twirling around low in a thermal with Scott sure was fun. It reminded me of other "good ole days". After about an hour I was ready to land and headed down to the LZ. Landing the T2C was just as predictable as flying it. Again, the roll response stays good all the way through the stall. Here is a shot of me just breaking the horizon. Thanks to Lucas for taking these pictures. I plan on mounting a camera soon so keep looking. I found this picture yesterday on the web. It's me landing on Terry's T2. I believe Scott took it and think it's great, windsock and all. 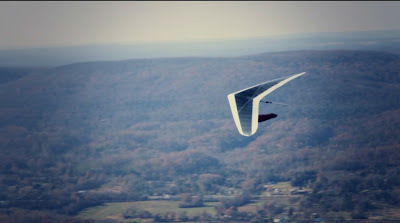 This is a GREAT flying glider! Previously owned and well cared for by Terry Presley, it is now on loan to me while I wait on my new wing to arrive from Wills Wing. It is in excellent shape with 50-75 hours on it. The sail is still "crispy" when you roll it up. Asking price is $4,000 o.b.o. Leave a comment if you are interested. Thanks.